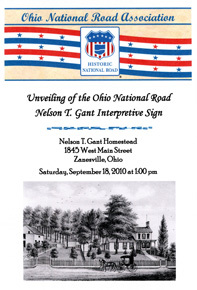 On September 18, 2010 the eleventh Ohio National Road Interpretive sign was unveiled at the Nelson T. Gant House. 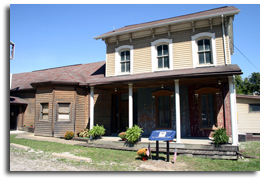 This site is located in Muskingum County at 1845 West Main Street (old National Road) in Zanesville, OH 43701. 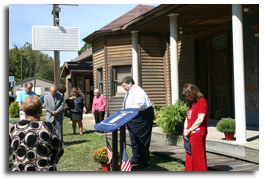 The unveiling ceremony began with a blessing given by Rev. Terry Newman. 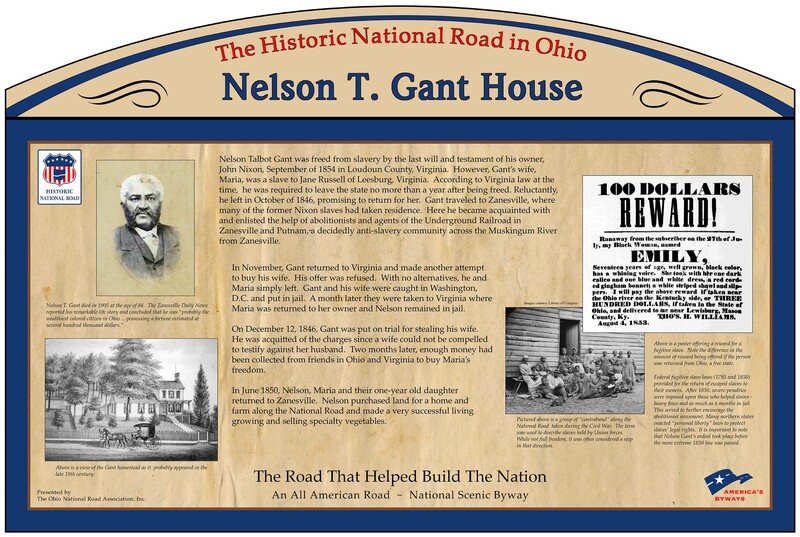 Zanesville Mayor Howard Zwelling was on hand to offer his congratulations to the Nelson T. Gant Foundation, and also related the importance of the National Road to the history of Zanesville and to the State of Ohio. 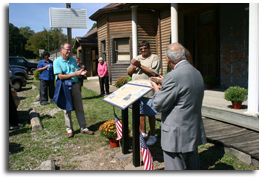 Muskingum County Commissioner Jerry Lavy (at center of photo) offered praise to the Gant Foundation for their efforts to restore the site and thanked the Ohio National Road Association for the interpretive sign. 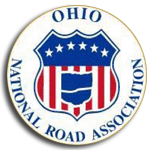 Nelson T. Gant Foundation President Richard Watiker thanked Ohio National Road Association President Cyndie Gerken for recognizing this site and spoke about the Foundation’s progress in rehabilitating and restoring the structure. 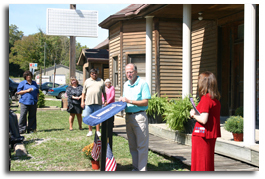 Richard also spoke of current plans to demolish some of the 20th-century additions to the original Gant home. 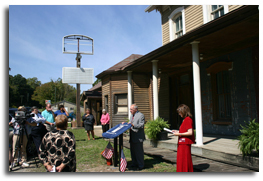 As attendees looked on, Commissioner Lavy, Gant Foundation President Watiker, ONRA President Cyndie Gerken, and Mayor Zwelling unveiled the Ohio National Road Nelson T. Gant Homestead Interpretive sign. 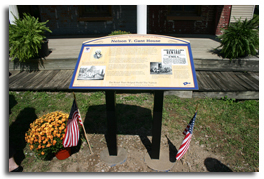 This beautiful Ohio National Road Interpretive sign was installed by local residents Butch Viney and Phil Newman. 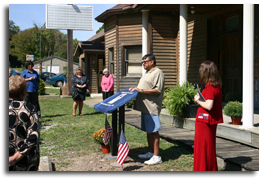 Also present (but not pictured) were ONRA Muskingum County Board representatives Mary Ellen Weingartner and Elizabeth Reeb. Following the ceremony, our speakers were joined by members of the Nelson T. Gant Foundation Board of Trustees. 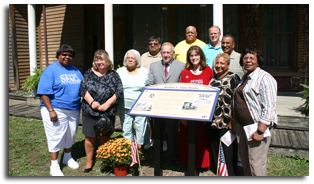 Pictured left to right are (back row): Gant Board President Richard Watiker, Trustee Raymond F. Gillard, County Commissioner Lavy, and Gant Trustee Michael Morgan; (Front row, left to right) Trustees Martha Mitchell, Lace Lynch, and Gertrude Morgan, Zanesville Mayor Zwelling, ONRA President Gerken, and Gant Trustees Connie Norman and Josephine Gillard. Also present (not pictured) was Trustee Beverly Newman.